Some days the press get “talkative Kimi” and other times it’s “laconic Kimi” and today it was a case of the latter, as the Scuderia Ferrari driver was not interested in commenting about feuds between other teams’ drivers, nor seeing much significance in the fact that this Sunday he takes part in his 200th Grand Prix. Raikkonen says that the team can still tailor the car for him. Max Chilton reckons he could have added to the Marussia Formula 1 team’s points tally at the Monaco Grand Prix if not for the clash with Kimi Raikkonen. 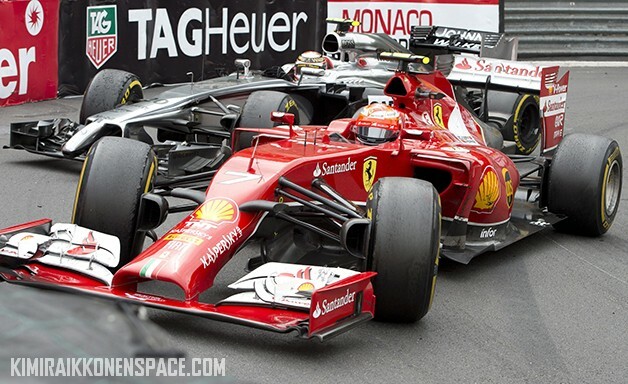 Chilton broke his front wing after colliding with Raikkonen’s rear wheel as he tried to unlap himself during the first safety car phase in Monaco. Although the incident was not caught on television, Chilton said there was little he could have done to avoid the incident because he felt the Finn had seen him. Explaining what happened, Chilton said: “You pass the safety car line twice and normally Charlie [Whiting] gives the message that the cars can now overtake the cars in front. “I came in to Turn 1 and asked my engineer, ‘when are we going to be allowed to overtake the cars in front? “By the time I got to Casino my engineer said ‘okay, now overtake’. So I came out of Casino, following Kimi and I stayed to the right, the whole way down into Mirabeau. The race stewards believed the clash was a normal racing incident, but Chilton reckons that there was little he could have done more to stop the collision once Raikkonen turned in. “I would do it again [like that],” he said. “I thought it was an open move but Kimi didn’t see me. It was slightly frustrating. “It wasn’t a lunge. I saw his onboard, he did his belts up, did a dial change, turned in and then looked in his mirror. “I have never been in a top team and I don’t know if they get a message, but I would have thought they would get a message saying, ‘watch out there will be cars’. I would look in my mirror and then turn. Formula 1 rivals Kimi Raikkonen and Kevin Magnussen say they have not spoken to each other following the various on-track incidents between them this season. Raikkonen blamed McLaren rookie Magnussen for “destroying” his Malaysian Grand Prix earlier this season, after a hit from behind, and also criticised the Dane for damaging his Ferrari in the next race in Bahrain. They made contact again in Monaco last time out, when Raikkonen misjudged a pass on Magnussen at Lowes in the closing stages. Magnussen questioned his rival’s judgement of the move after the race, and joked with Danish TV that maybe Raikkonen had been drinking. But Magnussen told reporters ahead of this weekend’s Canadian Grand Prix that he had not spoken to his rival about any of the incidents. “There’s not much to talk about really,” Magnussen said. “I’m pretty sure we both understand what happened in those different incidents, so we learn and move on from that. Raikkonen reiterated that he only hit Magnussen in Monaco after running out of steering lock and needing to reverse to rejoin the track, and said he wasn’t bothered by criticism from his rival. “He can say what we wants in the news, that is his choice,” Raikkonen said. “Sometimes it goes like that. “I tried [to pass him] in Monaco, but I didn’t hit him – I just couldn’t turn around any more.